Within seconds of landing, Mars rover Curiosity was sending images of one of Curiosity's wheels on the Martian surface. Basically, the rover worked perfectly — exactly the way Mission Control had hoped. 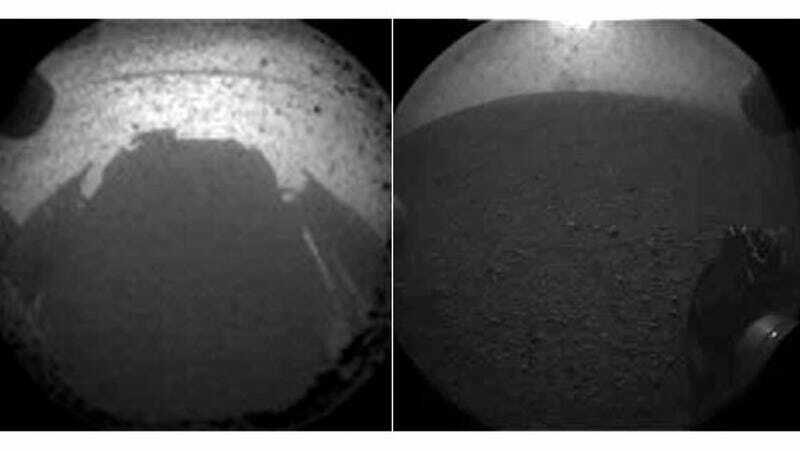 These photos show the two ultra-small image files that Curiosity sent to Earth as soon as it landed — one from the back (that's the shadow of Curiosity in the afternoon sun on the left) and one from the front (the wheel). The images look dusty because Curiosity still had protective lens caps on its cameras. After Curiosity lands she will point her high gain antenna at Earth so we can have a direct communications link. It will then send back a front and rear Hazcam image showing the terrain. We should have those images within an hour of landing. The team will use those images as well as telemetry during landing to try to localize where we are on Mars. The estimate is that we will know where she is to within a hundred meters or so within the first few hours. And we already know! Excellent. You can see more images from Curiosity via NASA.